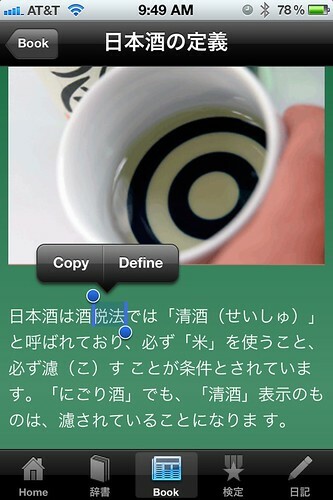 Home » decoding sake » new sake app helps japanese language learners. 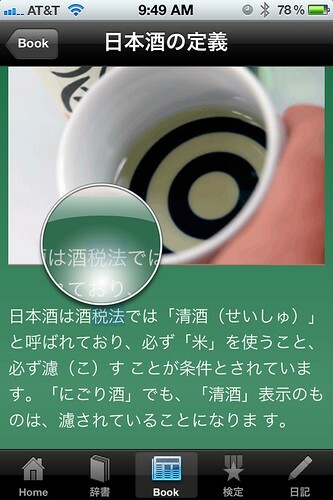 new sake app helps japanese language learners. While studying Sake over the years, I have found it invaluable to read about Sake in Japanese. Reading English language texts puts you at the mercy of the author’s/translator’s agenda, and the cultural nuance can get muddied. 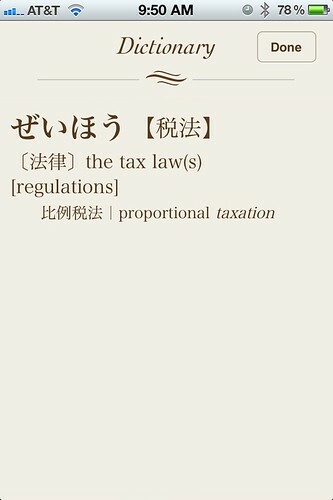 In my pursuit of better language skills, I have been increasingly turning to my iPhone. The Sake apps I’ve found so far have had great content, but share a fatal flaw: none has had selectable text for the dictionary function on your phone – until now that is…. 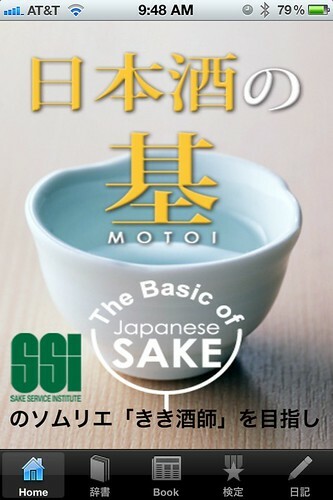 The new Sake app from SSI (Sake Service Institute) is designed to be a basic primer into the world of Sake. The SSI is an organization dedicated to the study and promotion of Sake. They are also responsible for administering the tests for kikizake-shi, translated as Sake Sommelier, the gold standard for licensing in the Japanese Sake world. The Sake app has several helpful sections: a glossary of Japanese breweries by area with links to their websites, decoding information on various labels, basic Sake grading information, and a Sake-related dictionary. It even has a section listing all of the Sake breweries in the U.S. and recipes for Sake cocktails. 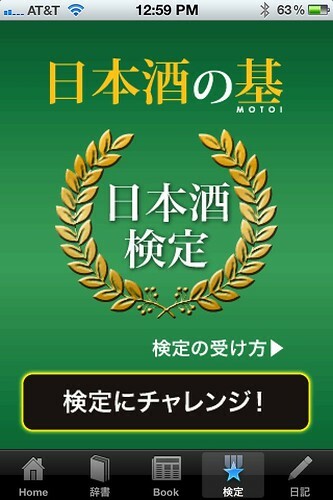 The “book” section of the app is packed with chapters on different aspects of Sake knowledge. There is a thorough selection of topics from the origins of Sake to ingredients and brewing methods. Once opened, these chapters are short but well written and illustrated. Most importantly, you can look up any words that you find. Most Sake apps have yet to utilize this iPhone function. It is this ability that sets SSI’s app apart from the others. A quick jab with your finger highlights any word or phrase with the ability to copy or define the term. Many Japanese language apps require you to copy and paste terms into a separate dictionary app but now there is integration to Apple’s built-in dictionary. Simply hit define and the app jumps right to the definition with no need for a separate app, getting back to reading is accomplished with a simple done button. These features alone would be enough for me to highly recommend this app to many Japanese language students with an interest in Sake. 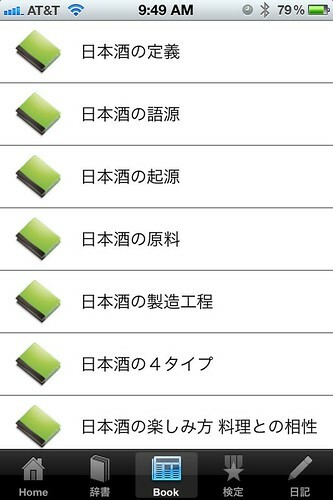 However, SSI’s app hits a home run with its final two features: a quiz and a Sake notebook. questions are fairly difficult. If they were too easy, it would diminish the usefulness of the feature. Now learners have a true challenge to test their mettle. The final feature is a nicely designed Sake notebook. The notebook has space for recording favorite Sake, and not just quick notes, but space for photos and sliders to denote flavor characteristics. I am really surprised that no one had developed an app like this for Sake lovers already. It is a shame that this one is only in Japanese. With quick drop down menus and sliders to record the attributes of your current glass of Sake, this is an app that I would definitely use in a bar or izakaya. Looks like a useful find. If I get out of the stone age and buy a device that uses apps, I’ll get this for sure. Remember the 酒屋 I told you about that has been going since Meiji? The guy who runs the shop has the “gold standard” 唎酒師 credentials as well. He has an intimate knowledge of many of the different 酒造場 and who learned from whom, etc.